14 weeks ago, on April 28, 2018, I ran my best marathon to date. Crossing the finish line, of my 14th marathon, I was exhausted and elated at the same time. I couldn’t believe that after several attempts, I had finally succeeded in holding the pace I had trained for, a seven-minute-mile average. I’ll be honest, the 2018 REVEL Mt Charleston Marathon almost didn’t happen for me. I trained for it, but the Boston Marathon, just 12 days prior to Mt Charleston, with its record rain and cold temps, was such a mental battle that I didn’t have anything left between my ears to get me to the start line of Mt Charleston–well, almost nothing. I can’t put my finger on what made me get on that plane to Vegas the Friday before my Saturday race, but something did. Something I am glad I didn’t brush aside, but fed enough to get me there. The year prior, I had pulled out of Mt Charleston after Boston. 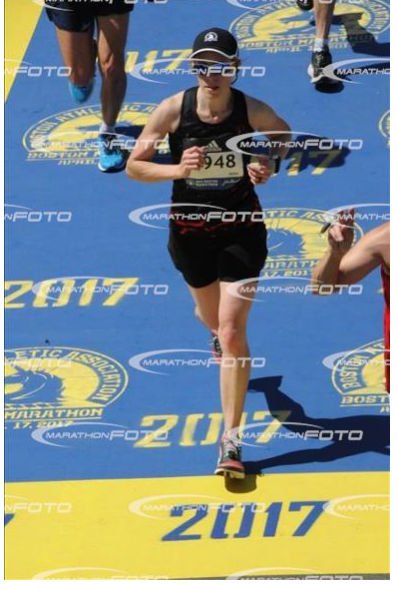 Boston 2017 was brutal in a different way than this year. And with Mt Charleston’s refund policy, I could pull out without losing any money so it was almost too simple to just stay home and not put myself under the kind of internal pressure racing requires. But, I went. I arrived in Vegas, to heat, heat and more heat. After a FREEZING Boston experience, it was a welcome change, but it did have me worried about my aggressive marathon pace goal. I was met at the airport by my cousin’s husband, Adam, and some second-cousins who were planning on running the Mt. Charleston Half Marathon. 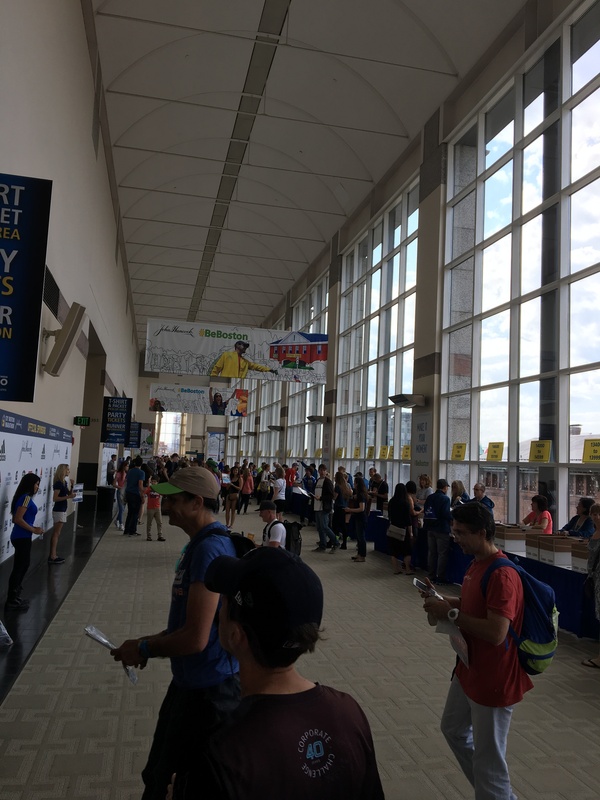 We went immediately to the marathon expo, a mere five minutes away. We picked up our race bibs and equipment and posed for pictures. They had this goal-time clock you could pose with. They asked me what my goal was for Mt Charleston. I felt sheepish admitting I wanted to get a 3:05 or better. And although I knew I wasn’t ready to break the coveted 3-hour marathon barrier at this race, it is always out there, like a dangling carrot. It was my out-there goal. And then I had my goal of just getting a PR which would be running faster than 3:13. They convinced me to pose with the clock posting each of my A, B, and C goal-finish times. I was super self-conscious to do this. I felt like the pictures with the 2:59 goal and the 3:05 goal were “you’re dreaming” goals. I had just come off a marathon two weeks before, and the race the following day was predicted to be hot–which slows race pace. Did I really have the physical stamina to pull off a seven-minute mile for 26.2 miles??? I had never achieved this. Was it even possible? I had some significant doubts, but I started this body experiment of mine in 2014 and couldn’t deny being a little curious about what I could do if I tried. Being able to dine out at Maggiano’s the night before the race, with family that was also racing the next day, was a definite perk of this race. Knowing I would have family at the finish line cheering me on was encouraging as well. It was so fun to catch up with them over dinner and be with them. I took my Maurten water bottle to dinner with me and dutifully sipped on my 320 mix as part of my carb-loading plan with the salad I had ordered. I didn’t eat at Maggiano’s even though the food there is exquisite. I have adopted a strict pre-marathon dinner meal of rice and chicken and had already eaten prior to dinner at the hotel. The drive to the Best Western Plus North Las Vegas was long so I was especially grateful to my cousin and her daughter for taking me. (They had to drive back too!!) Las Vegas traffic is CRAZY. The hotel we were driving to was chosen by my dear friend, Sharolyn, who was also there from Castle Rock, CO, running the marathon with her sister as a kind of sisters’ girl-trip. It was out there, but it was comfortable and affordable. My family dropped me off around 8:00 pm and I immediately went in to start my bedtime routine. I had to be up at 3:00 am for our marathon bus-loading window from 3:30 am-4:30 am. Bus-loading was about a 25-minute drive away from our hotel at a Home Depot parking lot. Temporary tattoo from Marathon Expo. They were applying them for free. The hotel room was comfortable and I went through the motions of preparing my clothing and gear for the next day. It was predicted to be chilly at the start of the race, but steaming at the end so I had warm clothes to donate at the top of Mt. Charleston right before the race. 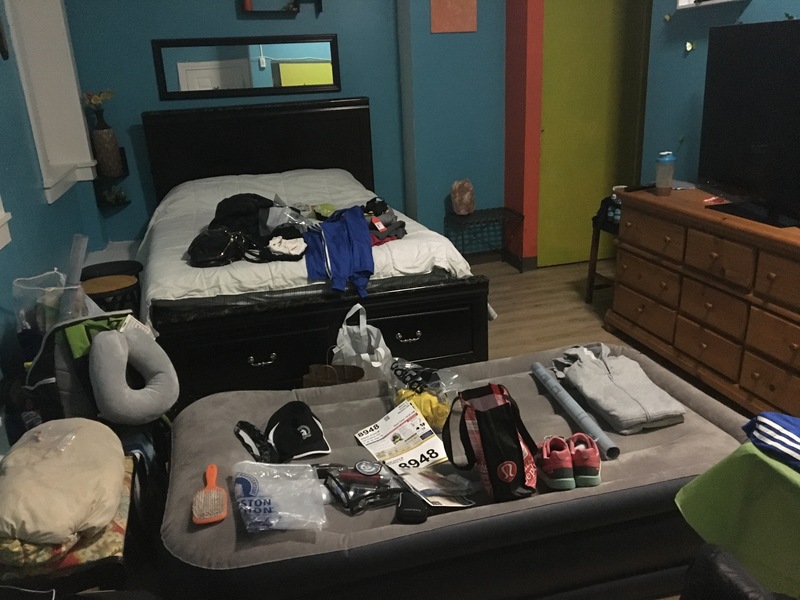 I pinned my bib to my singlet, laid out my shorts, sports bra, Altra Torin 3.0 running shoes, Boston Marathon 2018 cap, my Apple iPod Nano, my Garmin Vivoactive HR pace watch–made sure it was fully charged after my Boston 2017 experience–charged my BackBeat Plantronics wireless earbuds, and packed my throw clothes–sweatshirt, sweat pants, and gloves. I prepared my gear bag that I was taking to the top with my 2:59 pace band (gave myself some rest-stop minutes to achieve my 3:05 goal), Base Salt Performance salt vial, my pre-race and post-race recovery Maurten 320 drink, a Clif Bar, my course notes, some Ibuprofen, water and my six nutrition gels I would need for the course. I was going through the motions, anxious to get to bed, get to the start line and begin the race. Pretty much every marathon eve is the same. There is so much anxiety between the night before and the start of the race. All the moving parts to get you to the start line and the waiting to start. It’s brutal. I just want to skip over all that and start running! My mental depletion after Boston was still there and all I really wanted was to get this race done and get home! But, I did the best I could to focus on the experience at hand and enjoy it…. I slept fine, awoke, and did my pre-marathon drill. I took my teaspoon of Mio in water first to get my system moving, then had my Quaker oatmeal. I would save my Maurten drink for the bus. I got dressed, grabbed my gear bag and headed to the Lobby to meet up with Sharolyn and her sister. There were so many buses at the Wal-Mart and Home Depot bus pick-up locations that it was challenging to find our marathon bus. The Wal-Mart buses were for the half-marathoners, and the Home Depot buses for the full marathoners, but the buses just lined the streets and weren’t labeled in any noticeable way. We had chosen to board our bus as close to the end of the loading window (4:30 am) as possible so we could get more sleep and have less time waiting at the top of Mt Charleston in the cold. We were slightly anxious since 4:30 had arrived and we weren’t on a bus, but eventually boarded the with the rest of the marathoners–a large group–that had also decided to board on the 4:30-side of the boarding window. The buses were comfortable and had a bathroom on them–yes! We got on and prepared for the 30-minute, dark drive to the top of Mt Charleston. It is always a little intimidating to drive the distance of the course and take-in just how far we are running. It always feels very far. I guess because it is! Prior to leaving for Las Vegas, I had studied the course and watched a REVEL Race Series video, with mile-by mile coaching on how to approach the course. I took notes of the recommendations and hills to help me plan my race strategy. The last 10k of the race was going to be the most grueling. Not only because of the hills and then flatness of the course after coming down Mt Charleston, but also because the heat was going to be a real speed zapper those last six miles of the course. I tried to visualize what I had learned about the course as we drove over it. Mt Charleston was definitely scenic. I was getting excited to get my feet on the road. We arrived at the top of a warmer-than-expected Mt Charleston at 7,633 feet of elevation. The road race would take us from the forests of Kyle Canyon on Mt Charleston to Las Vegas, Nevada, on a 2-4 percent downhill slope through the spectacular scenery of the Humboldt-Toiyabe National Forest. From start to finish you lose 5,126 feet in elevation. That’s some significant downhill, but my body is built for it. I have learned on other REVEL courses that I handle downhill impacts well. The warm temperatures of the peak of Mt Charleston were worrisome. That meant it was definitely going to be a warm finish. They were estimating it would be in the low 80s at the finish. It was in the mid-50’s at the start. Perfect temps for starting. The winds were going to be an issue at different parts of the course because they were headwinds, but there was nothing to do but embrace the weather for what it was. I was thrilled it wasn’t going to be freezing and raining the whole time like Boston had been! Our bus arrival was slow so we only had like ten minutes before race start once we arrived. We booked it to the bathrooms to get in line so we could go once before getting on the course. I had been drinking my Maurten 320 drink on the bus and was feeling really full. I couldn’t even finish it. It was time to take my Clif Shot Cherry Chocolate pre-race gel–I take it 15 minutes before start–but my stomach felt so full and, well, “off” really, that I didn’t want to put it in me. I opted on taking half of it on our walk to the porta potties. The porta potty lines were moving slow and I was starting to get really nervous about missing the start of the race. I really wanted to get in with the 3:05 pace group to help me stay on track for my goal. Sharolyn and I were a ball of nerves at this point. 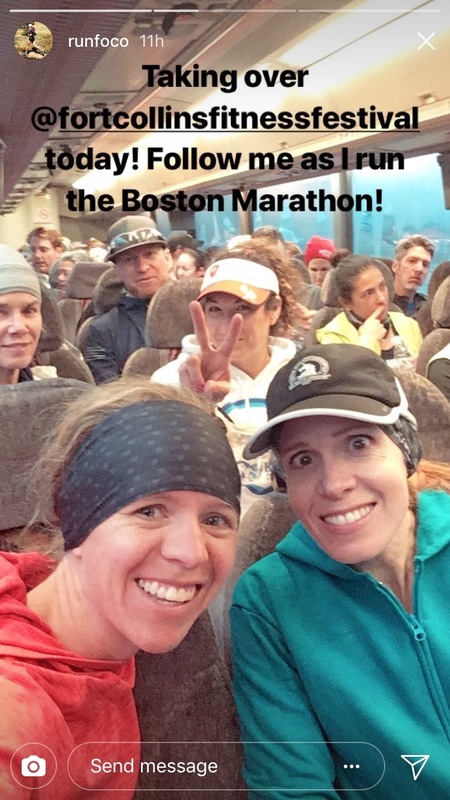 She was going for a 2019 Boston entry spot with a BQ at Mt Charleston and also felt the stress of the looming start with us still in line for the bathrooms! I gave her a hug and wished her luck, made it in and out of the porta potty and started jogging to the start line, shedding my “donate layers” as I ran. Lucky for me, the race didn’t start on time. I was able to weave myself up to the front of the starting pack close to the 3:05 pacer. I felt out-of-place among all the men and again questioned my sanity for thinking I belonged there. A few women were also sprinkled there among the men and I began wondering who would stay the course. My stomach still felt too full and unsettled. It was too heavy for a race start and I didn’t like the feeling of it. It was my first time racing with the Maurten and I felt like I just had too many carbs in my system. I was too fueled. There was nothing to do about it, but it was troubling me a bit. The countdown began and it was time to run. I knew from my course studies that I wanted to keep the first mile easy. One, because my 41-year-old body always takes a mile to get to pace and I didn’t want to burn through too much glycogen right out the gate, and two, because the course climbs the first mile. I started the course at 6:07 am. I was feeling sluggish out the gate and surprised when I could no longer see the 3:05 pacer. I kept to my commitment to run “my race” and didn’t panic. About a mile in, my side started to hurt. I could hear the liquid sloshing around inside my stomach with each foot fall. Yuck. I knew that side aches typically resolve if you just keep going and try to breathe regularly so I did this. After the first mile I found that I was running with the 3:30 pace group. What??? This was not the plan. I needed to start accelerating, but it had to be a steady increase so I wouldn’t ruin my race in the first three miles–yeah, I’ve done that before. I slowly kept speeding up, to try and make up for my slow first mile. I kept my eye on my heart rate at regular intervals to make sure it wasn’t climbing. My side was still killing me and I could tell it was affecting my speed. I was cursing my Maurten drink at this point and wondering what to do. I had read that if you can hear water moving around in your stomach it means you needed more sodium; that the body isn’t absorbing the fluid properly because there isn’t enough salt. So I reached for my salt vial–the salt vial I had never used before but was counseled to take because of the predicted temps–and attempted to consume some salt while running. That was an epic fail. I found out (after the fact) that you tip the vial over on your finger and lick off the salt particles to get a few granules. I had attempted to put it to my lips and lick out some granules while still staying at my 6:30 per mile pace. The result was WAAAAY too much salt. I sputtered, spat, and swallowed. Oh, well. There was nothing I could do but hope for the best at this point, but needless to say I was not feeling too optimistic at this point on reaching my goal. Sometime around mile four my side ache stopped. Maybe the salt helped? I’ll never know, but I was able to continue at my 6:35-6:40 pace and was slowing getting back on track. I hadn’t even passed the 3:15 pace group yet! I wouldn’t until around mile six. So, I’m running along and the 3:05 pacer runs by me. What?? I look at him and mention how I had been trying to find him. He had stopped to use the bathroom at the most recent water stop and was running to catch up to the 3:05 group. I followed him and finally landed myself with the 3:05 runners. All male except for one other female by me. I was meeting my split goals at this point, and keeping my heart in check. Anytime I saw my heart rate start to climb I would slow a bit until it would steady out and then keep on. My body felt good. I was keeping up with the group. The scenery was beautiful, the grade was perfect. Not too steep, but just enough of a descent that my lungs weren’t dying from the speed I was maintaining. So far, so good. The 3:05 pacer was funny. He had a cyclist friend biking beside him while he ran. The cyclist was barely peddling, but when he did pedal you knew you were on a climb. There were several rolling sections thrown in there over the course of the race, but nothing terrible. Really, the first 19 miles are pretty dreamy. Around mile six, I began to take two water cups at aid stations. I would drink one, and then pour the other one on me. I hadn’t really taken in any water until mile six because my stomach hadn’t been up to it. I had even delayed my first gel. Typically I would take it at mile six but ended up taking it at mile eight. I worried about this, but, again, my stomach was just not happy. The temperatures were already warm and I just kept on, hoping to stay on pace and make my goal. I look like I peed my shorts, nope, just the result of multiple cup-drenches to bring my temp down. This girl didn’t want me to run beside her, only behind her. Finally, she started to slow and I moved by her. Never saw her again. After we turned onto the highway at around mile 20, the 3:05 group really started to thin. The girl I had been trying to pass for forever, slowed and I passed her. I was slowing too which was concerning, but I knew I would the last 10k. I just had to make sure I didn’t slow too much. It came down to me and the 3:05 pacer in front of me. Everyone from our pre-existing pack was gone. At one point, we pass a guy who had been with us, but who had pulled out to go faster. He cursed loudly when the 3:05 pacer passed him, with a frustrated and drawn-out F-bomb. 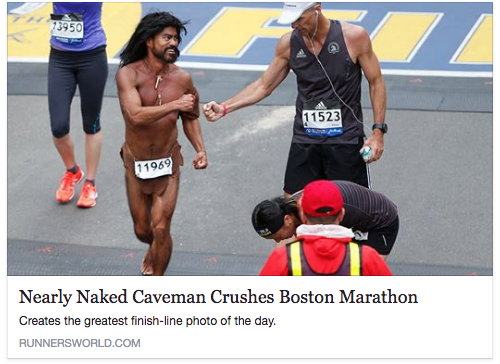 He must have been trying to qualify for Boston. 3:05 is the time for men ages 18-35. The pacer told him not to quit; that he could still do it. But I could tell as I ran past the guy that he was done. I think he was surprised to see that I, and I alone, still remained with the pacer. Yeah, I was surprised too! Around mile 24, my legs were starting to feel weak. I really wanted to stop and walk. I was hot, my heart rate was up there and it was all I could do to try to catch the 3:05 pacer who was now about 30 feet in front of me or more. I knew there was still one more hill to crest and then I had a slight downhill to the finish. If I could just get over this last hill and then take advantage of that slight downhill grade to recover and get me over the finish line. In my head, I knew my friends and my family were tracking me. They knew exactly where I was on the course. They knew I was just a couple of miles from my goal. Thinking about them cheering me on–somewhere out there–kept my legs turning around. At some point, either mile 24 or 25, I’m not sure now, I was REALLY fighting stopping and walking for a bit and I suddenly could visualize my friend, Natalie, running right beside me. It was almost like an apparition it was that real. She was yelling at me–in loving Natalie style–“Don’t you stop!! You can’t walk now. Just keep going! Don’t stop!” She ran with me. I didn’t stop. Sometime after I crested that last course hill, I started to get some speed back. I had slowed into the 7:30s, but that last stretch I started to feel the finish line. The 3:05 pacer was still off in the distance. I kept trying to catch him, inching myself closer. I hit a group of rowdy spectators and they saw that I was close to the 3:05 pacer, and nearing the finish line. “Go Timex!! Pass the Pacer! Pass the Pacer!” The crowd must have felt my goal; must have known that I needed to get in front of the 3:05 pacer to make my goal. I wasn’t looking at my watch anymore, just running as fast I could. Their cheering cheered me and I was able to find some kick. 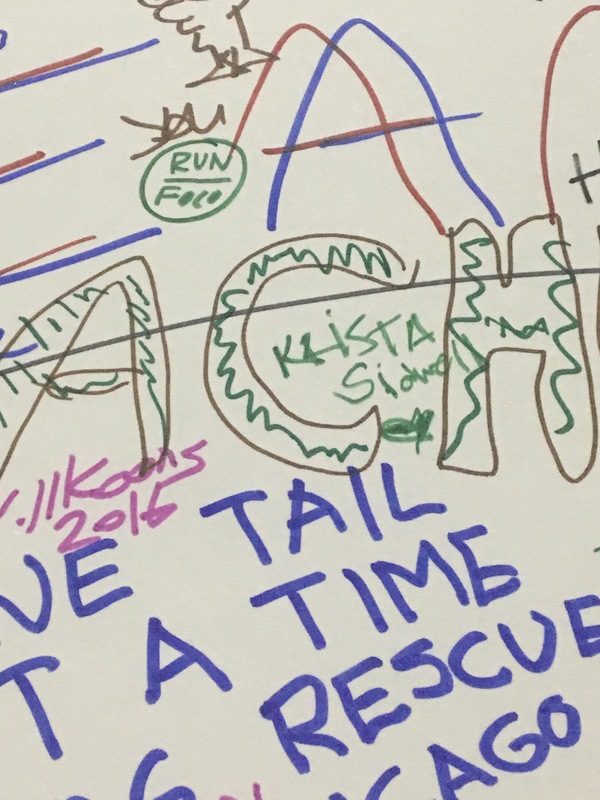 Pass the pacer, Krista. Pass the pacer. I hear my family but don’t ever really see them. All six of them were lined up just before the turn for the finish line. I heard them yelling, “Go, Krista! Go!” And it touched my heart. I was giving it all I had at that point. I felt like I was running through mud, but I just kept pushing. The finish line was now in sight. The clock read 3:03 something. What?? 3:03?? But I just passed the 3:05 pacer? I hadn’t known that he was coming in under time. I passed over the finish line, exhausted with a time of 3:03:37. I had done it. (See me cross at 2:04:45 below). I crossed the finish line, took my medal with glee and immediately sought water. Once I had water and a towel, I worked to stabilize my breathing and approached my family on the other side of the finish line gates. They were so congratulatory and excited for me. It was so wonderful to see them and to have them there when I put down my fastest time ever. Adam had my stats up and told me my average pace and finish time. It was definitely a time of celebration. I needed to keep on moving for a bit because I was feeling light-headed. I excused myself and went to calm my breathing and try to settle my body from the past three hours of rigorous mental, physical and spiritual effort. I really feel like race directors need to have the finish line and then like a quarter-mile straight stretch where you can jog it out and bring your heart rate down more slowly rather than racing 26.2 miles and then abruptly stopping. I have to keep moving after until my heart rate has reached its recovery BPM. I downed some chocolate milk–for recovery reasons only–and returned to the group. I was awash with emotions, but the ruling emotion of the moment was contentment and gratitude. Victory. We went over to the results table to get my official time card. It was then that I learned I had placed first in my age group and 5th female overall. I was immensely proud of this. My 41-year-old body had competed with much younger girls/women and a large field of men. I was 40th place total out of both genders. This was a happy moment. I retrieved my recovery bag next because I knew I wanted a couple of my items in there. Namely my Ibuprofen and the Maurten recovery drink I had planned on taking. Typically, I cool down so fast at the end of a marathon that I also need extra layers of clothing, but it was sooo hot that I didn’t need any of those. I did want my phone, however. I temporarily left my family and went in search of my recovery bag. On the way, I took advantage of the Deep Blue stations and had my legs sprayed to ease the muscle soreness that was present already. A youth volunteer met me in route to the gear bag check and offered to go and retrieve my bag for me so I wouldn’t have to walk as far. That was nice! Bag in hand, I returned to the course to be on the lookout for Sharolyn crossing the finish line. The Las Vegas sun was already so hot even at 9:30 am. There was no shade to be found. I waited and looked for my friend but never saw her. I decided to check my phone for race results and discovered she had already crossed the finish line with a time of 3:30. She had qualified for Boston with room to spare! I was so elated for her. I went looking for her and found her near the gear pick up station. We celebrated together! I got lots of “congratulations” from strangers that saw me on the course which was fun. I still couldn’t believe it had all come together for me. Reading through the texts from family and friends post-race brought tears to my eyes. Reading their communications between each other as I raced made me feel so loved! I have awesome friends and family! Although we finished around 9:10, 9:40 am, we remained at the finish line for hours. Sharolyn’s friend was still on the course. She was having a really hard time and having to walk almost the entire last 13 miles. The upside of all the waiting time was that we got to take advantage of the Rapid Reboot recovery station they had. This pneumatic compression technology is supposed to improve blood circulation post-marathon by transferring higher volumes of oxygen-rich blood to muscles as they recover and rebuild. It helps reduce recovery time while curbing delayed-onset muscle soreness and inflammation. Honestly, I don’t know if the ten minutes I spent in the Reboot system helped or not, but it felt good–and it was in the shade. When I went to look for Sharolyn, I got separated from Adam, my cousin Monique and their kids and didn’t get to see them before they left. I knew they were headed back to their hotel to recover and we planned to try to meet back up later for dinner before my flight that night. By the time Sharolyn’s friend arrived, we were ready to go. It was approaching noon, it was even hotter and I just wanted a shower and to get out of my race clothes. It was 1:30 when we arrived back at the hotel, four hours after our marathon had ended. I had missed my 1:00pm check-out time, but luckily they didn’t tack on extra charges. I grabbed my stuff, checked out and headed to Sharolyn’s room down the hall. Sharolyn and her sister let me invade on some of their sister time and use their shower since I had to check out of my room. (They were staying an additional night). They let me shower first–so nice!–and I quickly did. As we calculated how long it was going to take for me to get to the airport for my 6:30pm flight, we realized that we would have just enough time to go to dinner and then hit the airport. Meeting up with my cousin and family by their hotel was going to take too much time. I was sad that I wasn’t going to be able to see them again before I left, but it was just kind of how the cards fell that afternoon. Sharolyn had done some pre-Vegas sleuthing and learned about a burger place on the Las Vegas Strip called Holsteins. It was near the airport so we decided to venture down there for dinner. Navigating through all the traffic and madness that is the Las Vegas strip was a little tiring, but we eventually found a parking garage and made it up to the restaurant situated in The Cosmopolitan hotel. Sharolyn and I shared a pricey $18 burger called the Fun-Ghi. (All beef patty with forest mushrooms, caramelized onion, gruyere cheese, frisee and truffle mayo—DELICIOUS! That salt hit the spot. The strawberry malt shake did the trick as well. Post-marathon food is THE best. I have to say, I was really happy to leave Las Vegas. The visual pollution, noise, traffic, and slot-machine heavy atmosphere that assails you on every front makes you feel like a constant passenger of a 2-star amusement park ride. The Mt Charleston course was beautiful, and apart from all that mania, but, yeah, Vegas is just not for me. I arrived at the airport with just enough time to spare, but my flight was delayed 45 minutes so I got to hangout a little longer than anticipated. I took advantage of the extra time to FaceTime with my family and catch up on responding to texts and congrats from family and friends. These moments when the race is over, you have completed your goal and you are just waiting to board your flight home are priceless. Your body is full with positive endorphins and life is just, well, good. This marathon will forever be one of my favorites because of who was there and because I finally achieved a big goal I had been chasing. The marathon experience was so positive that now, months later, I have settled into a running contentment I didn’t have before. While breaking the 3-hour marathon barrier would definitely be sweet, I am so happy with what I achieved on that course that I feel peaceful. I’m still running daily, still trying to improve, but something has definitely shifted in me with the sport. Next up for me is the Black Squirrel Trail Half Marathon in Fort Collins in September and then the St. George Marathon in October. St. George will be a new course for me and I earned a sub-elite spot and perks from my Mt Charleston finish time so it should be fun. Running it with some Fort Collins friends too which always makes a big difference. We’ll see what I can put down there. As I’m sitting here in my cozy living room, by the fire, with my feet up, I am contemplating how different I felt crossing the Boston Marathon finish line 5 days ago. Here I sit warm and relaxed. Clear-headed. 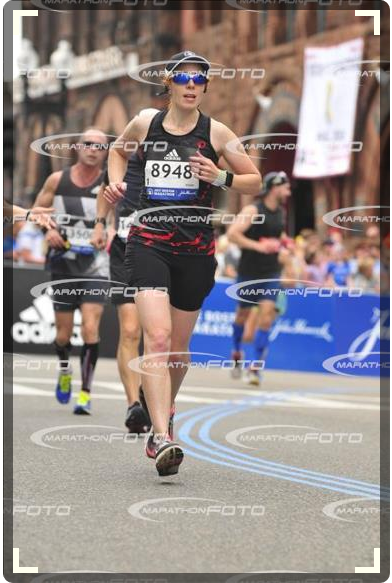 But I was anything but warm or clear-headed when I ran down Boylston Street to the finish line a few days ago. I woke up to snow today. Snow mixed with rain at the end of April. That’s Colorado for you. I had an 8-mile run on my schedule, but one look at that weather, and even though the temperature was like 40 degrees, I just couldn’t muster the willpower to go run outside. It brings back rather unpleasant memories/sensations from Monday’s race to be in any conditions that are wet, windy and/or cold. Almost like a weird kind of PTSD…. I know, that sounds kind of dramatic, but it was….dramatic. And a little traumatic, if I’m being honest. 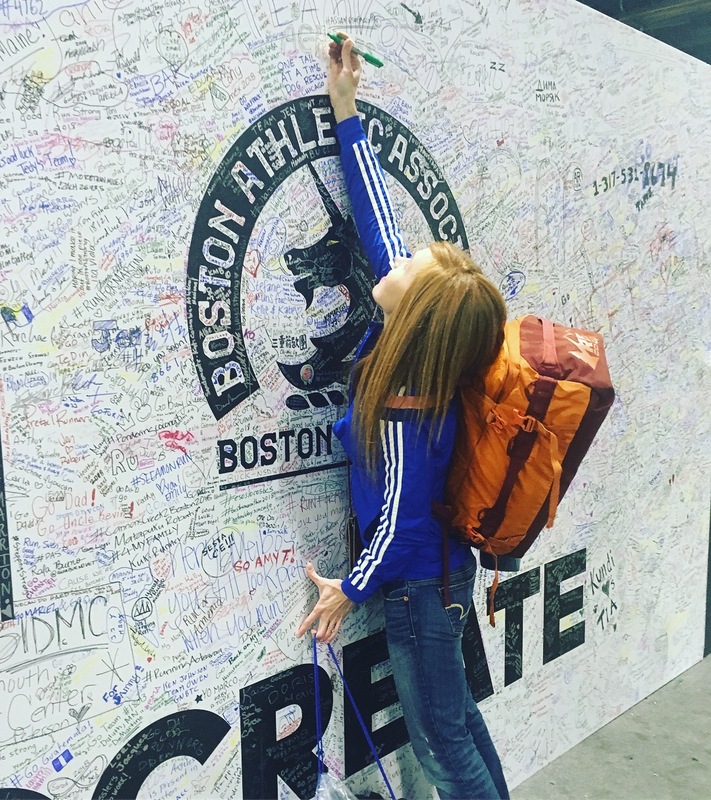 Over the last couple days, more and more of the running community that ran Boston this year have been posting their experiences on social media. Everyone has an epic tale to tell. There is this sense of catharsis with these posts. Like you have to share your story to come to terms, mentally, with it. It was one of the hardest mental battles I have ever fought. Why? The race-day weather. The starting temps were in the low 30’s with a wind chill around 20 degrees. Along with those weather challenges we also had headwinds up to 35 mph, and constant, heavy rain. Tough stuff. I feel this kinship with everyone that was out there on Monday; taking on the elements as they battered our bodies and souls. We were down in the trenches together. Our adversary was the weather and ourselves. There is definitely something dreamlike, something ethereal to my memory of Boston, but I will try my best to capture, in words, my experience. This is when I give you the disclaimer that this will, more that likely, be a very long post. Read on if it interests you; if not, well, thanks for visiting! My running memoir is just that, a memoir. So, it is important to note some key players in this year’s Boston story. My good friend, Brooke Clayton, plays a starring role. Other characters include a vibrant, talented group of Fort Collins runners that traveled to Hopkinton with us by bus this year. We had the privilege of hanging out with them in the Running Club Athlete Village (more about that later). The training cycle for Boston had its ups and downs. 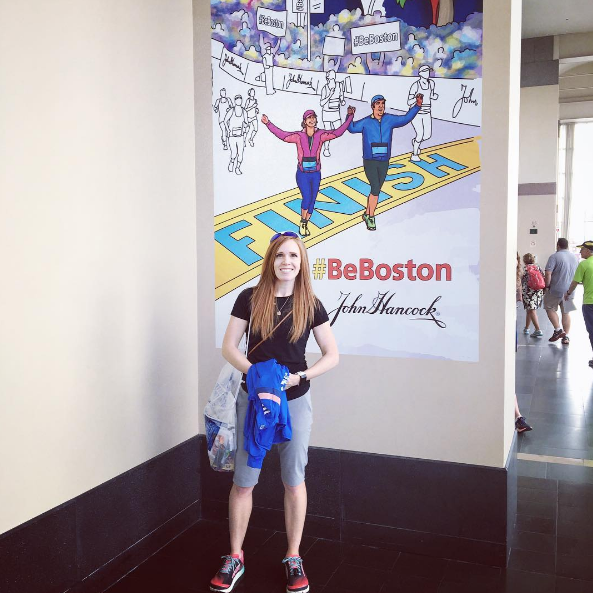 While I stayed injury – free during this training cycle–except for some minor Plantar Fasciitis–Brooke was hit with Influenza B hard our last month before Boston. She was so sick she couldn’t even run. But, she came back strong about three weeks before Boston, totally Brooke-style. We left Fort Collins around 5 am on Sunday to catch our 7:57am departure out of DIA. Emptying our bags of liquids and foods at the TSA screening was comical. Only a fellow marathoner could understand why we had so much food! Carb-loading was still in full swing AND we had all our in-race nutrition and post-race stuff too! We boarded our plane without any incident, but then United decided to keep us on the runway for an hour and then add an hour to our flight. That was long. The problem was Boston. Boston was being hit with freezing rain and causing United to reroute and approach from a different direction. To do this, they had to add fuel to the plane to compensate for our extra traveling distance. We were a little concerned by our delay because we were already landing, without the delay, just three hours before the Boston Expo was ending. Arriving before the end was crucial because we had to pick up our racing bibs in order to be able to run! We ended up landing at 4:30pm and went directly, by Uber, with our backpacks, to the expo. 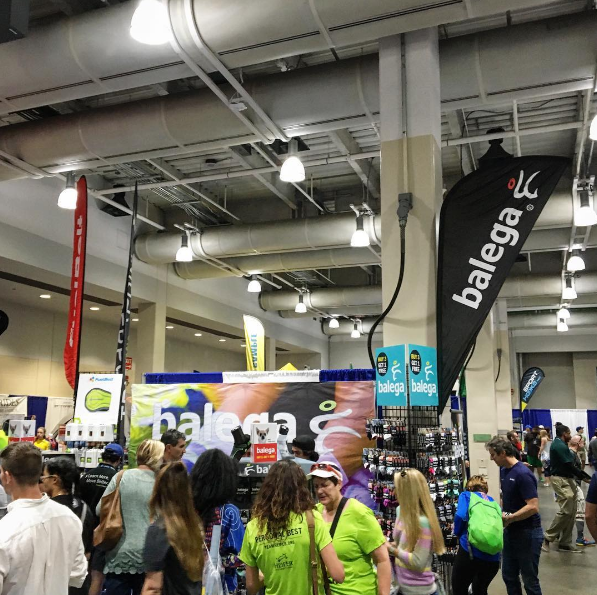 The expo was pretty deserted by then, but we were able to get our race bibs and spend a little bit of time visiting the different vendor booths and getting a few gifts for family. 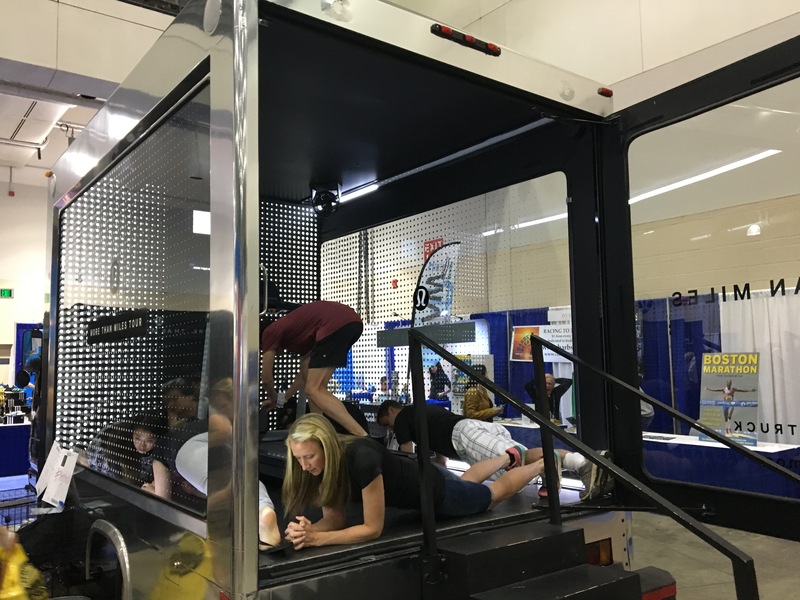 The Boston Athletic Association (BAA) had set up a free shuttle from the expo to the Back Bay where our hotel was, but finding where to grab the shuttle proved impossible. When we left the expo, the wind was blowing, a light rain was falling and it was FREEZING. We gave up on finding the shuttle stop and decided to hail an Uber. The three minutes the Uber app reported it would take our Uber driver to get to us stretched into 15! Brooke sought shelter in a nearby garage and I kept look out. It was a desperate time. We were tired from flying, fatigued from carrying our backpacks/bags around since the airport, we were cold, and filled with anxiety for the race the next day, oh AND hungry! Finally, the Uber arrived and we jumped in. We got settled into our hotel room at the Boston Marriott Copley Place and went in search of food. While in Fort Collins, I had done some sleuthing and had found a restaurant near our hotel called SweetGreen that could make a rice, chicken, salad meal to order so that we could get the carb-loading, pre-marathon meal that we desired. Getting to the restaurant was another fun adventure–we took the sky bridge. The Boston Marriott Copley Place is the sweetest Boston hotel that I have stayed in. It is connected to the Shops at the Prudential Center by an enclosed sky bridge. This meant we had access to 40 shops and 18 restaurants without having to feel one drop of rain. Since this trip was pretty much non-stop rain (aside from the day we left–of course) the sky bridge access to these incredible stores and restaurants was beyond convenient! We briefly checked out the hotel and discovered a hot tub on one of the levels. Yes! We decided we would definitely need to visit that after the race. We arrived back at our room and prepared for the next morning by laying out everything we would need and loading our bag for the bus. My Timex Factory Team jersey had arrived in the nick of time. Luckily, Boston’s late start meant we didn’t have to get up before 5:30am. I ordered an Uber to pick us up at 6:00am to take us to meet our private bus at MIT, and we hit the light. At this point, we were both feeling pretty nervous because of the weather and because of all the moving parts to get us to the race start. We were both ready to start running and to finish running. Alarms woke us up on time and we prepared for battle. We dressed, I had 8 oz of water with a double-serving of Mio (getting a little caffeine in the system; wakes me up but also helps wake up my intestines which is helpful if you have a few hours to go before a race). We took a quick pre-race pic and left our hotel to look for our Uber. Intersecting with our Uber was going to be tricky because I wasn’t planning on running with my phone. This hadn’t occurred to me until that morning, but with the Uber already scheduled, there wasn’t much I could do! I took screenshots of the information about the Uber car and driver and texted them to Brooke and we headed down. We are the black dot. That’s our Uber…. We headed downstairs to look for our Uber. We had an arrival window and we weren’t sure if he was there yet. Brooke spotted him a block or so away and we headed toward him as fast as we could in the rain–oatmeal and bag in tow. We were about half way to him–running–and Brooke noticed he was starting to drive away. That would be disastrous!! We had to make it to our private bus on time to get to the start and to get a seat with our friends. We kept on running while our Uber, luckily, was stopped at a red light. I literally jumped in front of his car to keep him from leaving and we jumped in. Brooke quickly downloaded the Uber app to her phone and we re-ordered him, promising him a nice tip for sheltering us and taking us anyway. He really seemed annoyed, but once we got him ordered–and he knew he was getting paid–he turned on the charm. We breathed a sigh of relief as he started us on our way to MIT, about 15 minutes away. Okay, let me just say right now, that getting a seat on the private bus enabled us to finish the 122nd Boston Marathon. Period. This was such a crucial part of our experience! A BIG shout-out to Terry Grenwelge of Fort Collins for the hook-up and for telling us to meet the buses at 6:30am–we had been planning on getting there later. Our Uber got us to the private bus right in the nick of time. We were able to hop on board immediately–still raining–and were surprised to see that it was already partially full even at 6:25 am–nearly 45 minutes before we were set to leave! Not long after our arrival, the bus filled. There were supposed to be 4 private buses parked along MIT for scheduled riders, but something happened and the other 3 were delayed. This meant that the other runners that arrived after our bus was full had to wait outside in the wind and rain until the buses arrived! We felt so bad for those runners! Fighting to stay warm was not how you wanted to spend your energy right before a marathon! So, A Little Bit About These Buses…. 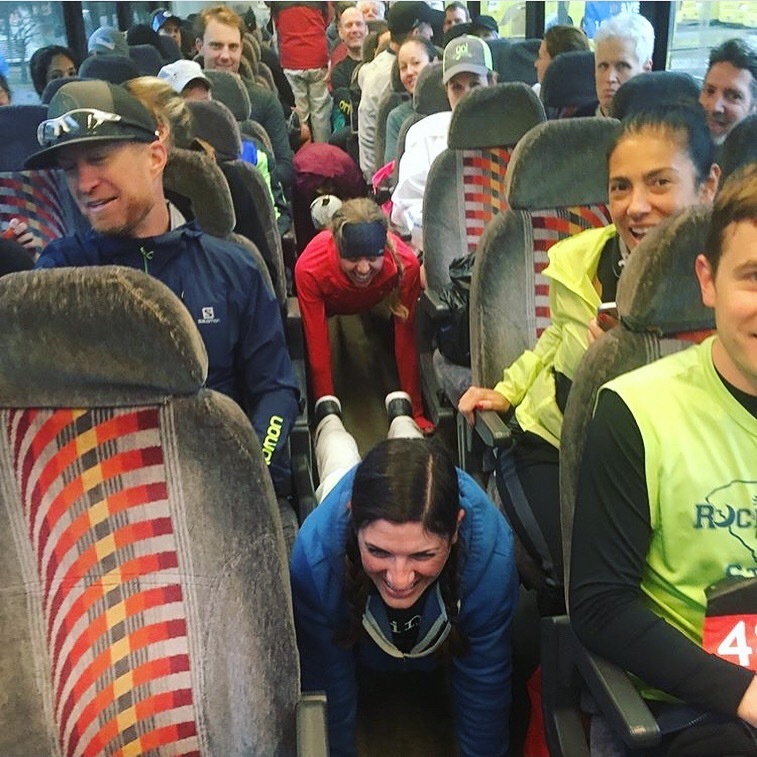 Running clubs provide comfortable intercity “coach” buses that go directly to Hopkinton from MIT. In Hopkinton, the buses park in a private lot adjacent to the Athlete’s Village at Hopkinton High School, in a lot set aside by the BAA exclusively for running clubs. The buses remain in Hopkinton, and available for passengers to use, until after the race begins. There are a limited amount of these buses so getting a seat is pretty awesome. That $35 was well spent. Not only did the bus keep us sheltered from the rain, but it also had a bathroom on board that I frequented several times. Once we arrived at the village, we had our own private porta-potties, right out the door, so didn’t have to wait in lines or even get more than a couple drops on us. The bus driver kept the heat going for the entire 3 hours we occupied this bus before race start. Seriously. Hanging out with our friends from Fort Collins, and meeting new friends on the bus, was such a great way to distract us from the pending, wet challenge ahead of us. We watched our red and white-bibbed friends begin to slowly exit the bus to head for the starting line corrals. (Although my Tucson Marathon time had earned me a white bib in wave 2, to run with Brooke, I needed to join wave 3–wouldn’t miss running with Brooke for the world! We took advantage of this extra time to prepare and try and pysch ourselves up for what we were about to do. While on the bus, we were also focusing on fueling ourselves physically. From the time I entered the bus, I finished my oatmeal, 16 oz of Maurten 320, and a 1/3 of a bagel. They called our wave and I was still loading all my gels, fixing my music, adjusting my poncho, tying bags over my feet etc. The time to depart had crept up on me and I was behind! I didn’t have my poncho set up and had an unopened space blanket in one hand and hot pockets in the other when I carefully stepped down the bus stairs in my bag-covered shoes. The wind and rain instantly assailed me. Trying to keep my poncho and space blanket around me was a joke. We joined the mass of runners walking up to the corrals from the Athlete village and then things started to get real. This was my fourth Boston, but nothing prepared me for the mess that was the Athlete Village. 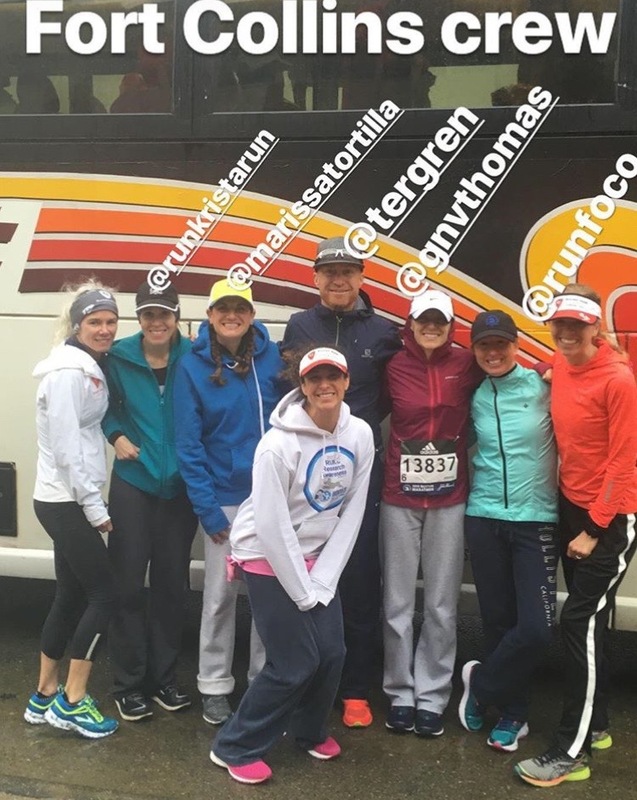 While we sheltered on our warm, cozy buses, thousands of other runners huddled under the massive canopy in the middle of the athlete village field; a field that had turned into a swampy, muddy mess from all the rain! What was usually a field of order, was absolute chaos. The race announcer kept reminding runners that only the blue wave should be headed to start line, but we were seeing yellow bibs everywhere–the wave after our wave. I started to feel panicky that we were going to miss our wave. It wouldn’t have been the end of the world; we could have started with yellow, but I didn’t want to stand out in this pelting rain and wind for any longer than necessary. At this point, we were all walking kind of blind. You wanted to look down to keep the rain out of your eyes, and everyone around you had their silver space blankets wrapped around their heads so it was hard to distinguish between one person and the next. We were a slow-moving, silver mass packed together like a bunch of slimy sardines. Mud and puddles of water were difficult to dodge as we tried to weave or way into the blue wave and out of all the yellow wave runners that had lined up–prematurely! I spotted several runners’ shoes that were already soaked and in some cases covered in mud. Brooke’s right shoe had lost its garbage bag and was completely soaked–not the way you wanted to start a marathon. I was worried for her; for us all! Somewhere in all this weaving, I lost Brooke and our bus friend, Marissa Mercurio, that headed to the start line with us. Not good. I started shouting out Brooke’s name, but couldn’t hear or see her. I had the horrible thought that we would be separated for the entire run, lost in this sea of soggy runners. I finally gave up looking for her, happy she at least had Marissa, and concentrated on not falling down (or getting too muddy) and kept shuffling toward the start line. My hope was that I would reunite again with Brooke in our starting corral as they divided this mass of runners into smaller groups. Clothes, trash bags, and food lay discarded everywhere in the two villages. (Usually, runners respectfully leave these items in the trash bins provided, but today, it seemed everyone was in pure survival mode and had just dropped things as they went.) It was such a mess. I can’t imagine how long it took to clean up!!!!! (26 tons, 50,000 pounds, of clothing were left behind. The good news, the proceeds all go to supporting local children). Head down, feet forward, rain pelting, wind blowing we all moved forward to the start. Through what could only be described as a miraculous event, I heard my name above the elements and crowds and saw that Brooke and Marissa had found me!! We joyously reunited and continued our forward movement. Our delayed departure from the buses, and our extra-long walk to the start line, resulted in us missing our wave start! This was absolute craziness. We are rushing as best we can to the start line, trying to decide when to shed our final warm layers that are offering us some protection from the rain, and realize we just have to start running! The volunteers aren’t even checking our bibs; they are just telling us to start running to catch our wave! We quickly stop and shed everything except our ponchos and sweatshirts. I gulp down my gel and we take off. We not only missed our wave, but the yellow wave is just about to start. We head over the start line with absolute zero fanfare and join the last stragglers of the blue wave as we begin our very wet, cold journey to Boston. The one upside to being late to our wave and missing the start is that there is hardly anyone around us when we start. Typically, you are so sandwiched in that you have to run at the pace of the pack. In our case, there was no pack! That was nice, but so weird at the same time. We fought to settle into a pace and to figure out the best way to run with the driving rain. I learned quickly that my “waterproof” gloves were getting saturated, and Brooke recommended I not use the poncho arm holes and just keep my arms/and hands inside under the poncho the whole run. This was genius and kept my hands from getting completely soaked. As I ran, I put the hot pockets into the top of each of my gloves and instantly my hands started to feel better–thank you, Brooke, for the foresight!! My hands stayed warmish a long time because of this factor. Once all my gear was situated, I tried to get my mind to a better place and enjoy what I was doing. We had planned on an easy-pace, under 4-hour-marathon finish since I was racing in the Mt. Charleston Marathon 12 days later. The easy pace allowed me to look around and try and absorb all that we were passing and seeing. 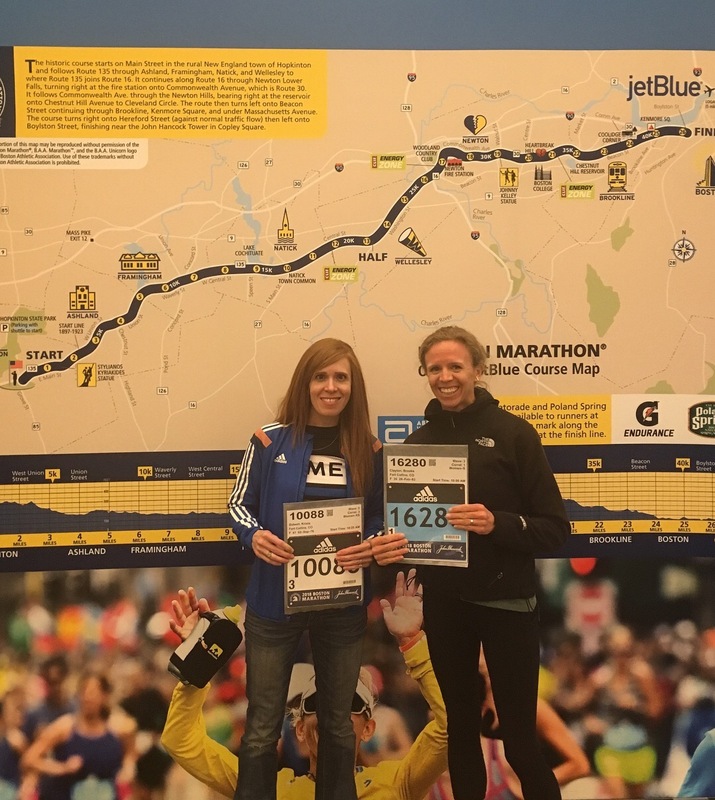 I DID enjoy many parts of running the Boston Marathon in spite of the horrible conditions, but it was a far cry from my other experiences out there. The number of blind runners–yes, blind–we saw out there taking on the elements inspired us. The wet roads acted as a constant reflection of the travelers they were carrying. So many beautiful images I wish I could have captured with a camera. . . .
Brooke and I both steeled our minds and were focused on getting this marathon task DONE, so we weren’t talking much. Luckily, we both had good tunes because we needed the distraction. Usually at Boston, it’s the crowds that overpower your ability to converse well. This year it was the rain and wind. The miles began to tick past and we kept our forward movement, one foot in front of the other. Most of the race is pretty foggy in my memory, but I recall all our stops. We stopped so I could shed my sweatshirt when I started to warm up–ha, yeah, that actually happened in the beginning; we stopped when Brooke was ready to shed hers; and we stopped to take gels and water. I was doing okay taking my gels until Mile 12. At mile 12, I couldn’t get my gel open because my too-cold fingers wouldn’t work. Brooke had to tear it open for me with her teeth! At mile 18 when we stopped to take our gels, I was struggling to even get the gel out of my pocket. A male volunteer witnessed my futile efforts and offered, sheepishly, to get it out for me! I hitched my hip in his direction and said “PLEASE! And will you open it for me too? ?” He was more than willing to help me out and then we were on our way again. I have to say, the spectators and volunteers that were out in this horrible weather helping the runners were AMAZING. What a thing to do. They made it possible for all of us to continue! Everyone was so encouraging. You could tell that everyone not running was sympathetic to what we were doing. You could feel their hearts. That is something I DO remember. Despite all the running drudgery and misery, I do, vividly, remember the Newton hills. This section had quite a bit of crowd support, especially as you ascended Heartbreak Hill. The hills felt remarkably easy this time around compared to other Boston Marathons. (Brooke had me training more hills and that definitely helped.) When we crested the top of Heartbreak I did a little dance–literally–because I was so excited that we were through that and into the last 10k. 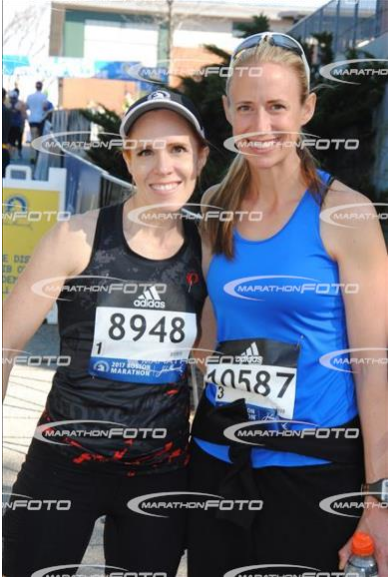 The hardest part of the race was over….or so I thought. Turns out I may have started celebrating a little too early. So, around mile 23, I was done with my cheap-o poncho. Seriously, I hadn’t invested in a nice poncho because I hadn’t planned on running in it. But discarding it never became an option because the rain was so fierce–everyone was running in their ponchos. But my poncho was unique in that it had an off-the-chart annoyance factor. The rain and wind turned it into Saran wrap around my body. It would cling to my wet skin and inhibit a good arm swing while running. Then at other times it would get totally turned around so that the hood was blowing up into my face. It was ridiculous. It was akin to Dr. Strange fighting the desires of his red cloak of levitation–my poncho definitely had a will of its own. So, at about 3 miles to go, I figured it couldn’t be doing that much for me–other than frustrating me to no end–so I whipped it off my body and spiked it to the ground with triumphant pleasure, much like a professional athlete would a touchdown football. At mile 24, I was so cold I was shivering and my teeth were chattering while I was running. This was new. I mean, in 2015, when I ran Boston in the wind and rain, those symptoms didn’t start until I stopped running. I was so cold that my legs started to feel like they were going to fall out from under me. Not like glycogen depletion; it wasn’t that. This wasn’t stiffness. This was simply frozenness. Brooke’s visor was so saturated it kept falling into her eyes, but her hands were too cold to tighten it. We pulled to the side and a kind volunteer tightened it for her and offered her a Ziplock bag with some dry socks for the finish line. Brooke profusely thanked her and proceeded to put the socks over her frozen hands! Lucky for Brooke, she still had her poncho on, but we were both frozen to the bone. I can’t remember if was mile 24 or mile 25 but somewhere in there, we almost landed in a med tent with the other 2,500 hypothermic runners that day. Our legs just weren’t working. My vision started to go wonky. But we were so close to the end and we knew that if we stopped at a med tent, chances were we wouldn’t finish. We kept thinking about the hot tub that awaited us back at the hotel and the desire to just get done overpowered our desire to seek medical assistance. As we got closer to Boston, and to the coast, it got colder, if that was even possible. But, it did. More humidity. More wind. And then we had the hardest downpour of the whole day as we turned at Hereford. A runner went down right in front of us. Just collapsed. She was quickly attended to so we kept on going. 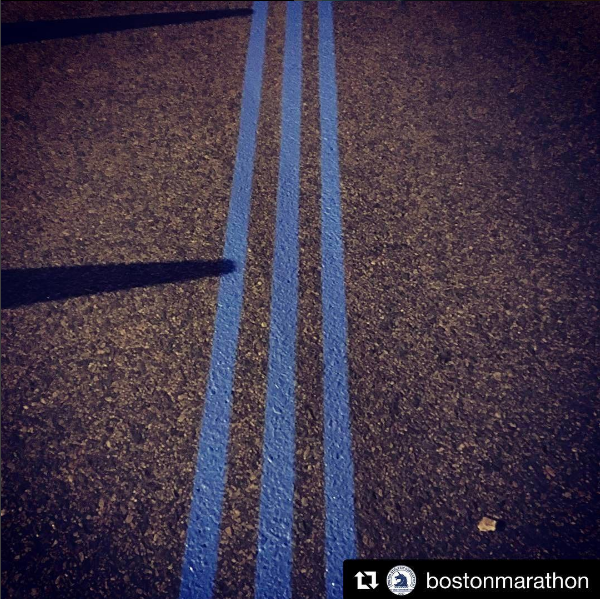 The crowds were thick and loud now and the blue line that marks your path to the finish was now beneath our feet. We took our final left turn on Boylston and could now see the finish line. It was more than a beautiful sight, but felt like a mirage. I don’t remember the noise of the crowds at this point. I don’t remember the feeling of victory that we were going to finish. I was numb. Physically and mentally. The finish line didn’t appear to be getting any closer despite the fact that I knew I was moving towards it. It was like an optical illusion, suspended just out of reach. At some point, the distance between us and the finish line disappeared and we were crossing it. We did it. We did it. We did it. My feet floundered a bit after I crossed and I reached out for Brooke and gave her a hug as a brief sob escaped my chest. Tears clouded my vision, but my body quickly reminded me that there was, simply, no time for this right now. I would have to breakdown later. We needed to get warm. We needed to get warm right now before our body temperatures fell even further. At this point, I’m not looking around. I’m not taking in any of it. I have one thought and that is that we need our heat shields (BAA blanket-type, hooded ponchos). The exit from the Boston Marathon course is a long funnel of blocks with different race-affiliated things at each block or so. The medal tables came first. Then the heat shields. Then the recovery bags with food/water to replenish the spent athletes. Getting the medal was memorable–we definitely fought for those–but of more immediate need was warmth. We stopped to pose for a quick pic from a race photographer that Brooke had the foresight to stop for; she knew we would want it at some point. I was shaking violently at this point. The trembling shook my body so hard I felt like I was having seizures. It was like my body was trying to shake some warmth into me. We arrived at the heat-shields station and you could tell that the volunteer was worried about us. He quickly got the heat shields around us as we fought to catch our bearings. We had our heat shields, but now we needed our hotel. We needed to get out of this driving rain and wind. We were near a course exit, and decided rather than walk the extra block to get our recovery bags, that we would rather walk the block to the hotel. A race volunteer pointed us where we needed to go and we went. The walk from the finish line to the hotel was less than a half-mile away, but dodging the people and trying to make our convulsing bodies move, while keeping our teeth from chattering off, made the walk seem endless. We got more than a few concerned stares as we moved on. We sought shelter in the Westin Hotel lobby when we didn’t see our hotel and quickly asked the bell boy how to get to our hotel. He told us, but demanded that we first stand by their lobby heater before we went another step. Much like a mother hen would her little chicks, he shuffled us towards a standing, top-venting heater and we willingly obeyed. We felt the warm heat and it was here that my quaking body, and frazzled brain lost it. I started to weep. I was soooo cold. I was so tired from the last four hours battling the elements. The crying was cathartic, and I just let it out much like you would a breath you had been holding for much too long. Brooke let me cry, she may have been crying too, I can’t remember, but after a little warming, she kindly urged me away from the heater so we could really do something about our condition at our hotel. Still shaking. Totally not all there mentally, but we made it up the escalator, and across into our hotel lobby. I don’t remember the ride up the elevator to the 23rd floor or getting into our room. I do remember entering the bathroom and getting all the wet clothes off me. The survivalist that was leading the show told me to turn on the tub and get in; that I didn’t have time to get in my bathing suit and seek out the hot tub some floors away. This seemed sensical, but the tub handle wouldn’t move. I pulled and pushed and yanked and blinked. Was this some trick of my mind? Why couldn’t I get the handle to move? What a sick joke. I discarded that plan and got my bathing suit on. I grabbed some recovery food from the nightstand that I had left from that morning, grabbed my phone, a water and we headed for the elevators. If I could have cannon-balled into the hot tub, I would have. Spiritually, I think I was, minus all the dramatic flare. It took me about 15 minutes in the water, and then I started to feel my survivalist persona take a backseat in my brain and myself return. The shaking stopped. The combination of blood supply and nutrition from my Clif Bar started to fire my neurons again. What did we just do??? Other racers slowly joined us and much like warriors after a battle, we shared our tales and victories over the course of an hour in the hot tub. The water didn’t feel hot enough, even though I’m sure it was piping. It did the job though. Usually, I can last 15-20 minutes in a hot tub before I start to feel too hot. Not the case here. I’m not exaggerating that it took me an hour to finally feel like I could get out. So grateful for that hot tub. That was bliss. Once we were warm, we were able to communicate with our families, shower and go for food. (I should mention here that, upon returning to our hotel room, I told Brooke about my issues with the tub handle. As a point for my sanity, she wasn’t able to get it to budge either. It wasn’t some sort of post-race delirium I was experiencing. We called the front desk and had a guy muscle it into action for us. Warm, clean and safe, it was at this point in our Boston journey that we were awash with contentment and satisfaction for a fight well fought. As the day proceeded, the question of the day wasn’t “did you run Boston”, but “did you finish Boston?” People seemed less concerned with finish times, and just awestruck if you were a 2018 Boston Marathon Finisher. I have to admit, I felt kinda like a rockstar, when I answered yes, we ran AND we finished. Looking back, it all seems more like a dream (or nightmare) then an actual experience. I too am amazed we were able to finish. Our long stops brought us in at a 3:44:55 finish, (well, 3:44:56 for Brooke because she was taking her poncho off as she was crossing the finish and so we weren’t exactly in sync over the line) but under four hours which was our goal. My favorite place to eat in Boston post race is the Shake Shack. Nothing screams recovery to me like a salty burger and fries chased down with a sweet, strawberry shake. There was a Shake Shack about a half mile from our hotel on Newbury Street; a walk that was primarily rain-free due to our convenient sky bridge and Prudential Center location. About a block of that distance was uncovered. When we exited the Prudential Center and stepped out into the rain to walk the remaining distance, we both froze in our tracks. We took one look at each other and walked right back inside. I love a good burger after a race, but just a drop of rain, mixed with wind, and the memories of our freezing ordeal just a few hours prior was too much for us. Brooke had remembered seeing a burger place in the Prudential Center so we easily discarded our Shake Shack dreams and headed to 5 Napkin Burger instead. It was no Shake Shack, but the bleu-cheese-bacon burger and black/white shake I ordered did its job. We shared a table with a runner and her mom from Australia and swapped stories. The nutrition discipline required for pre-marathon racing doesn’t really allow for some of the sweets I often crave, so post-marathon is all about justified indulgence. Even after a shake, we still had room for a florentine cannoli after perusing (and drooling) through Eataly. Definitely want to try dinner there sometime, but the basement cafe had some great treats too. The cannoli was no Mike’s Pastry, but, yeah, rain? Not having it. 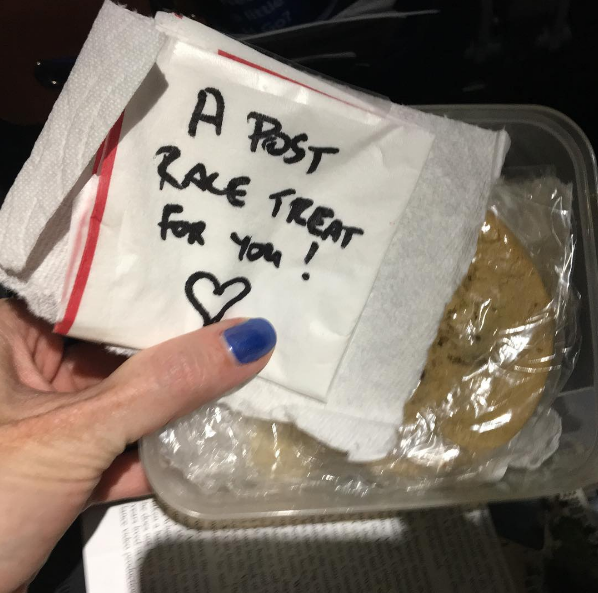 Luckily, my husband had packed some post-marathon Mary’s Mountain Cookies, for me as a surprise in my bag, so I had those to enjoy back at the hotel too since it was too wet outside to go in search of the Boston Cookie Monstah. After some delightful strolls through the Prudential Center, we headed back to hang out in the lobby of our hotel and wait from some Fort Collins friends. We returned to our hotel room, prepared our bags for our early airport departure and soaked in the happiness of a goal achieved. Sleep found me sooner than I thought it would and we were both out like a light. We left our soggy, mile-heavy shoes as a hotel donation and grabbed a 6:00am Uber to the airport. We were welcomed with an EXTREMELY long security line, but when the TSA agent asked if we had run the marathon, we were quickly given VIP treatment and taken straight to scan our boarding passes and through the x-ray without taking our shoes off OR emptying our suitcases of any liquids etc. That felt pretty good. So many people wanted to hear about our experience. It has been fun to share. Our travel home was so much smoother than our trip out. For one, our Jet Blue plane was so posh. We both watched a movie on the way home, rehydrated and relaxed. We landed at 10:30am and still had a drive home, but made it home without a hitch, and in astonishingly good time because Brooke was driving. It’s May 6th as I finish this entry–life has been busy. 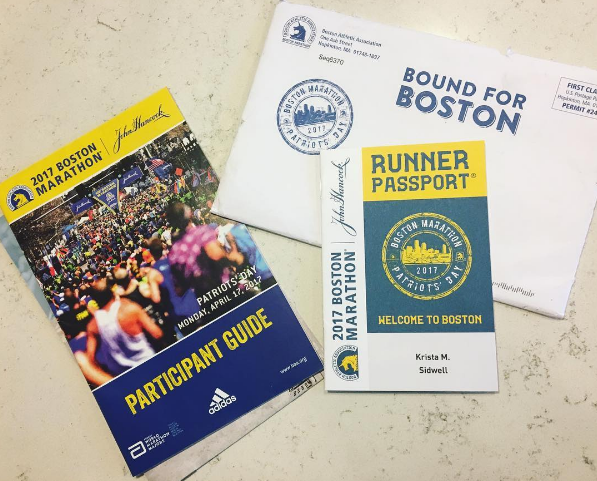 When I think about the 2018 Boston Marathon, I feel a real sense of accomplishment. It was brutal and I really disliked the run itself. REALLY disliked it. BUT it will forever be one of my favorite marathons because it was such a fight and we finished. 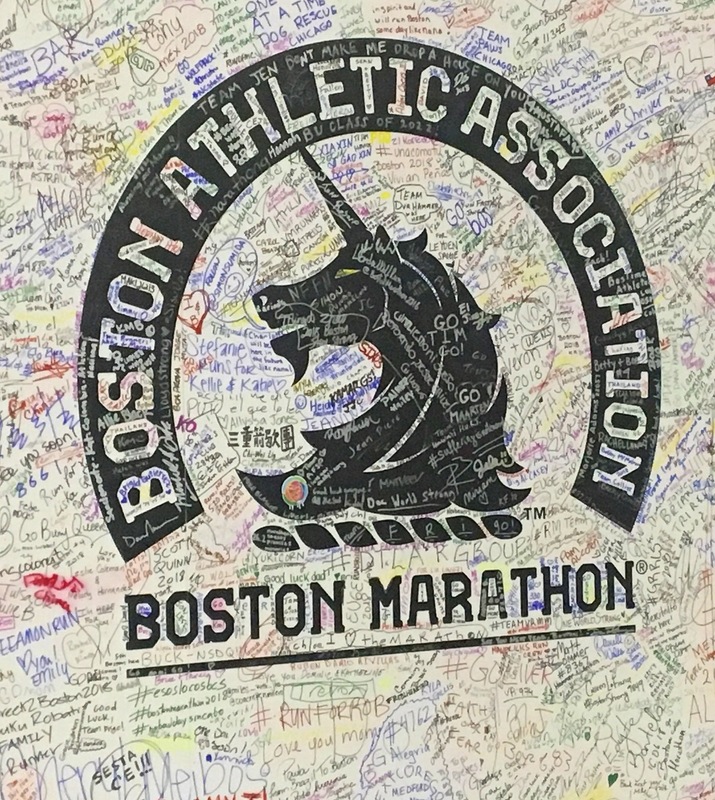 It is one of those Boston Marathons that will be remembered and talked about for years to come because of its brutishness. It was the coldest in 30 years–some say the coldest EVER–and the first one in 33 years that had been won by an American woman (Desiree Lindon). It was a race that brought even elite runners to their knees and opened the doors for former unknowns to shine in the 2nd-6th spots. It was a marathon that stripped you to your core and showed you what you are all about. Why Did/Do You Do It? Some might ask, why would you put yourself through that? What drives you? Why didn’t you just stop?? Some mistake it for pride. But they are inexperienced. It’s not the medal or the label, it’s something far more valuable than that. It’s the journey–beginning, middle and end. Our experiences shape who we are. Every struggle I have faced–both those I have signed up for and those I haven’t–have chipped at me and etched me in defining ways. Life sculpts us, and if we allow for those chipping and etching moments, we begin to discover a more detailed version of ourselves underneath. We are so much more than our outer layer. We are multifaceted. But excavating those layers that lie beneath the surface of our character, necessitates that we allow for struggle. We must permit hard things to test us, then give them everything we have at that moment. The joy of prevailing is hard to top. The result is, I love more deeply, feel more acutely, see more closely and can give more freely with each iteration of myself that I uncover through adversity. That’s the gift. Receiving my 2017 Canyonlands Half Marathon 1st Place Female Masters Award. My return to the course in 2017 piggybacked our annual family trip to Moab. Both my husband and I had been working on improving our speed and were excited to return to the course. Cycling along the race course with our kids. This year, the race was at the end of the kids’ spring break so we did all of our playing before. The downside of this approach to a race is you: 1) have the race hanging over you the whole trip; 2) feel like you have to restrict your steps/activity to conserve race glycogen; and 3) you feel more restricted in your dietary choices. Not the optimal way to run a race, but family time trumps racing! As far as destination races go, Moab, Utah, ranks right up there with the best of them! Our traditions always include biking, swimming at the rec center, visiting our favorite food joints, sliding Sand Hill outside of Arches National Park, and hiking in and around Arches National Park. The Fiery Furnace (permit required) hike is always a MUST DO on our list. Hiking the Fiery Furnace in Arches NP–NOT a fan of the addition of arrows to guide you through. On the top of Sand Hill getting ready to do some sand sledding with my girl! Race day started with an early morning hotel breakfast and bus ride up the canyon to the starting line. The absolute worst part of this race is the freezing wait and the late, 10:00 am start time. You board the buses at 7:30 am, which makes for a long wait after your 11-mile transport up scenic highway 128. This year, I failed to pack my space blankets and froze during the 90-minute wait up in the windy, shady canyon. But, even with the teeth-chattering cold that was shattering my body, I was excited to test my pace on this course. I stayed in my extra clothes for as long as I could until it was time to check our gear bags then I stripped off those crucial layers and prepared to find my pace group. As I was adjusting my Ipod Nano and wireless earphones, I was very disgruntled to learn that my earphones had decided to not work. After two months training with this new tech, I had never had any problems, but, of course, three minutes before race start, they decide not to work. I had checked the battery power that morning before leaving the hotel and they were set for 6 hours of performance after being fully charged that night. As the race director counted down the seconds to race start I gave up my attempts to force them into action and stuffed them in my pocket just as the gun went off. Racing 13.2 miles without tunes was not cool. I will forever have a spare set of non-wireless headphones in my gear bag just in case from now on! This video clip offered by the Canyonlands Half Marathon organizers can give you a little idea of the race start. I was totally off rhythm during the first part of the race. I was frustrated that my earphones weren’t working and was struggling with a pace watch that was clocking me going much slower than I actually was. (GPS issues in the canyon). Because most of my training that winter had been on the treadmill, I struggled with knowing what my pace was “by feel.” This challenge, coupled with a skewed pace watch output, caused me to run my first few miles too fast, clocking my first mile at 6:40–much faster than my goal first mile time. Expending too much glycogen in the first few miles of a race can kill your race. Sigh. Subsequently, the race felt like a fight from the get-go. Training on a treadmill just doesn’t transfer well to the road. The speeds I was capable of on the treadmill didn’t sync up with my road performance on this rolling course. You have to log time training on the type of surface/conditions you plan to race on. End of story. I knew this, but thought the impact it would have on my overall race would be marginal. Ha! No. I fought to stay strong even though I was running in the red zone of my heart rate for pretty much the entire race. Knowing I had kids and family waiting for me at the end of the race drove me forward. My kids don’t get to see me race as much as I wish they could so when they are there I feel especially driven to do well! Much of why I run is for them; to teach them to work for goals and always do their best. Approaching the finish line was exciting as I knew I was almost to the end and could use the last of my reserves–which wasn’t much, truth be told. I didn’t know where I was in the pack or just how many women were in front of me, but I knew I had put it all out there and had given the course everything I could that morning. I heard my family before I saw them and that was THE sweetest part of the race. Sweeter than crossing the finish line and sweeter than my moments on the stage later. Hearing my children and extended family cheering me on, and being reunited with them after a long haul, was worth the pain and struggles on the course that day! Surprisingly, my finish time earned me a first place ranking for my division–First Female Master. Overall, I was 14th for my gender which–at the age of 40–I’ll take with a smile! The majority of the women in front of me were in their twenties. . . . I’m determined to keep the aging process at bay as long as I can! My 1:35:44 time also qualified me for the New York City Marathon if I want to run it again. You can totally see how I burned myself out in the beginning of this race and it showed as the race progressed. Totally started slowing down! My finish line crew! My husband, my 3 children, 4 nieces and 1 nephew, two sisters-in-law and two brothers-in-law! 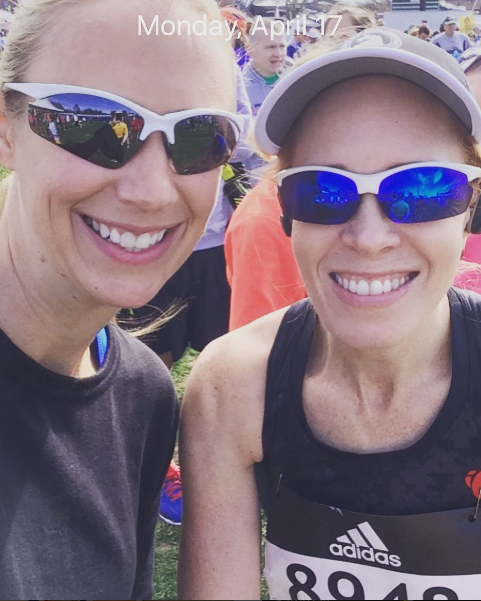 I raided the recovery tents for water, electrolytes and glycogen-restoring foods and then we returned to the course to look for my husband. Stephen finished strong and made his goal to come in under 2 hours! He finished with an admirable 1:54, 8:46 per mile pace. Following his finish we camped out to wait for the official results and discovered I had earned first place in my division and would be honored at the awards ceremony. That was an exciting race result for me since I had my family with me to celebrate with me! I love the backpack they gave me for my award. It is hard to read the text in this picture but it says: Canyonlands Half Marathon: Sheri Haymore Award Female Master 1st Place 2017. (Apparently, 12 years ago on this course, Sheri Haymore, a 40-year-old mom of four, collapsed a half mile before the finish line and died so her girls present this award to the first place female master each year. Made me tear up receiving this award from her children! After you get done with a race, regardless of how you finish, there is a tangible weight lifted of your spirit and body. All the unknowns you carry before a race are gone. Hopefully, goals have been achieved and you can finally just unwind and relax from a season of hard effort! Being the foodie that I am, I love the extra guilt-free calories that are afforded me on race day to replenish what I have lost. We definitely feasted at Miguel’s Baja Grill that night–my favorite restaurant in town! Santo Rosalia Enchilada at Miguel’s Baja Grill in Moab! Sled Giant Sand Hill (in front of Arches National Park Visitor Center entrance) Bring plastic sleds (discs). If you use Sandboard was you can go faster. You have to do a few runs with the sled to make a track and then you will fly! Cycling: 1)Colorado River Trail; 2) paved path from out of town into town; 3) Bar M Trail; 4) Countless others, but these listed are good with kids. Paradox Pizza – Delicious garlic knots! ; Order pizza by the slice. Until next time, Moab! Adieu! In preparation for running the NYC Marathon in November of 2016, I decided I would do a warm-up half a couple months before to try my running equipment/routine out and to see how my training was going for me. I decided to run the Breckenridge Half Marathon because it was being held in a city I love that is just a couple hours from my home, and because I knew the fall scenery would be spectacular. Since the race starts at 11, 481 feet above sea level, and stays at 9600 feet above sea level for the majority of the race, I knew this wasn’t going to be a race that I could plan to achieve a PR at. The half is just part of the action here; there is also a full marathon–America’s Highest Road Marathon–and a 1/4 marathon option. All races start up on Boreas Pass Road and finish on Breckenridge Main Street. I must say, for this race only being in its second year, it was done quite well. The small field was appealing and also helped with the superb roll-out of this event. Vertical Runner Breckenridge–the premier running store in the area–helps sponsor and host this amazing event. The half starts at 8:15 am and shuttle vans take runners to the start up Boreas Pass. Running through beautiful Summit County Colorado in September is hard to beat. Fall colors abound! The majority of this race is on a paved rec path with generous downhill at the start and then steady rolling hills for the remainder of the race. To view video, click image or here. I loved the small-town feel and charm of this scenic course, but be warned that you will feel the elevation! Even with regularly training at 5200 feet above sea level, doubling that really makes a noticeable difference! I felt like I was running up a hill constantly, even on flat terrain because of the elevation component. That being said, I was still able to run about a 7:45 average pace and achieve a top-finishing time–but I fought for it! Especially over the last 4.5 miles of the course which are a slow ascending paved trail to the finish. Having my kids and husband find me on the course and run with me through the finish were beautiful highlights of this experience. I run/compete for them; to teach them to do their best at whatever they choose to pursue, so having them there to see me finish and be on the podium, was really great. Depending on your goals, this race could be for you! Even though I loved landing on the podium, it took significant work to get there because of the elevation. If I was to return to this race, I would run it at a fun, comfortable pace rather than try and race it. That component took away from the experience for me. So, if you are looking to put your racing skills to the test, this may not be the course for you. If you are looking for a fun, beautiful, well-organized unique race in a gorgeous setting to just get out and enjoy running–it is definitely for you! 2nd Female with a time of 1:42: 17; 5th overall. I loved the wood medal that I received at the finish, the delicious food they provided at the Vertical Runner store after the race, and the unique wood trophy I was awarded for my finish time. The Beaver Run Resort in Breckenridge is the host hotel, and offers discount rates for race participants. This hotel was SOOO fun! Our family had a blast trying out their row of outdoor hot tubs, swimming in their heated pool that is half outside, half inside, and playing mini golf in the basement of the hotel. They also have a fun arcade in the basement that awards tickets and prize machine the kids can use to trade tickets for trinkets. Breckenridge has no shortage of things to do, so it is a perfect place for a family-race-weekend. Biking, hiking, exploring main street, riding the gondola are all recommended! Nearby Frisco is also one of my favorite Colorado towns. Peppino’s Pizza in Frisco is a great place for a pre-race, carb-loading meal the night before (try their garlic knots!) We also love getting ice-cream/treats at historic Foote’s Rest Sweet Shoppe on Main Street in Frisco. We often bike around Dillon Reservoir in Frisco. It is a beautiful, paved path with picturesque bridges and landscapes. Main Street in Frisco is also charming! Summit County in the Fall is hard to beat! Crossing the finish line for the 2016 New Your City Marathon!–The 2016 NYC Marathon was the World’s Largest Marathon in History! 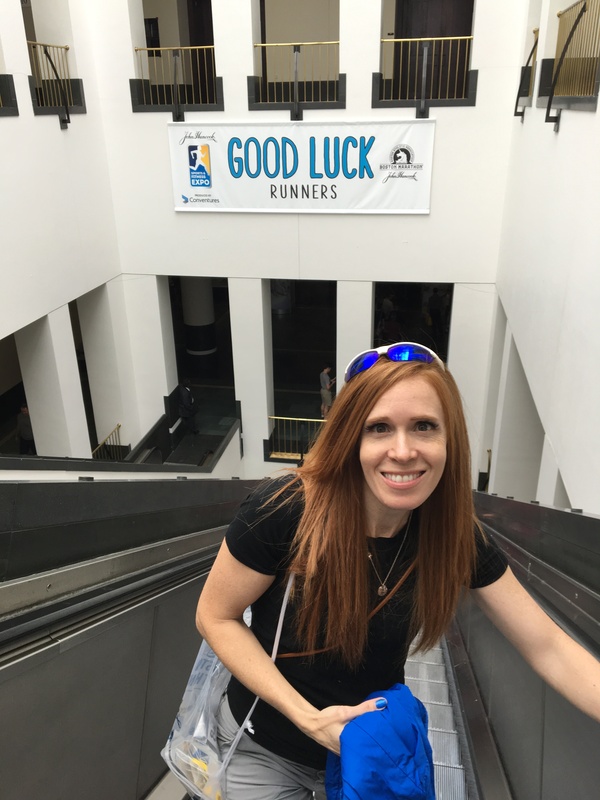 HOW NOT TO RUN A MARATHON . . . .
Know the course and train for the course. I mean, that’s a no-brainer, right? But, yeah, totally didn’t incorporate hill training in my marathon training and it hurt me big time. There is a reason the New York City Marathon is not advertised as a fast marathon. It isn’t. It is a hard, grueling, hilly course. Prepare for it and it is possible to have negative splits. Don’t prepare for it and you will, most likely, crash. Yes, I did. Everyone knows this is NOT something you should do. Running in new shoes is a no-no. But the week before the marathon, I started developing shin splints–a sign, for me, that my shoes have reached the end of their lifespan. 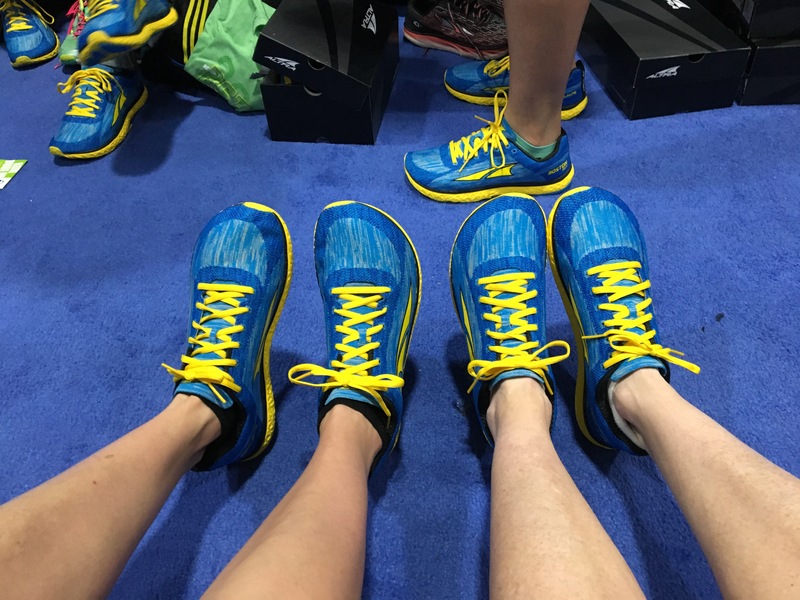 From my research, I read that it would be better to run in a new shoe, identical to the shoe you have been training in, rather than try and run a marathon in a shoe that is done. So, I purchased a brand new pair of my beloved HOKA Bondi 4.0s and tried to get as much running in them as I could during the last week of my taper. I should have been tracking my miles in my shoes better during training to avoid this. (The lifespan of shoes is usually between 300-350 miles). Or, I also read, that you should buy a new pair of the shoes you want to run your marathon in, run 50 miles in them to break them in, then box them up until race day. May try that next time around. The three days leading up to race day I had logged 34 miles on my feet and then threw in 4 hours on bikes–11 miles–the afternoon before the race. If you have a time goal, do your sightseeing AFTER the race. Come in a couple of days before the race–even just one day before if you can swing it–then sight see after. While I knew that would have been a better way to safeguard my vital muscle glycogen stores, I didn’t want to be in NYC with my son on election day and after. I figured, regardless of who won, there would be unhappy people and it could get dangerous. And it did. So, there really was no way for us to avoid putting the sightseeing at the front end of the race this year since the NYC Marathon was just a couple days before election day…. AND–this is a BIG ‘AND’–my top priority for my trip to NYC was to make some solid, beautiful, educational, foundational, AMAZING memories with my son and husband. I wanted to show him the NYC I have grown from and grown to love from my visits. So, when I look back on my marathon outcome, it was definitely a 3-star-out-of-10 experience for me compared to everything else we did. But, we had SO MUCH FUN in NYC, that I can’t look back on how we spent our pre-marathon days and hours with any real regret. I knew I was risking my race glycogen stores traipsing all over the city, but it was a risk I was willing to take. No regrets. The NY Times lists the names and finishing times for all marathon finishers. I got a copy at the Marathon Pavillon after the race! Try and get on a color course that goes over the Verrazano bridge, not under. One, it is prettier; 2) your GPS won’t have as many issues–hopefully–and 3) the pacers are up there!! I really wanted to run with the 3:05 pacer, but the courses don’t intersect until mile 8! My race was already destroyed by then. GPS goes haywire ESPECIALLY if you are on the green course on Verrazano Bridge (which I was under the bridge on this course and GPS was crazy.) GPS also struggles in congested areas like: Queensboro, First/Fifth Ave, and Central Park. The bus ride from the ferry to Fort Wadsworth (athletes village) is like 45 minutes. If you don’t get a seat–which I didn’t–sit down in the aisle. Don’t stand the whole time-like I did. Force yourself to conserve in the first half of the marathon or you WILL die in the second half. Do train hills!!!! There are five,long, steep hilly bridges on this course! And undulating terrain throughout. Don’t go too fast on the Verrazano Bridge–it can–and will-kill your race in the first mile. The first mile is a 3% grade hill for 8/10 of a mile. Hold back on the 3.4 % decent for the mile down the bridge. Go too fast on that one and you’re a goner too. The first two miles should feel annoyingly easy. THIS IS WHERE I KILLED MY RACE. The race starts at mile 17. Get to mile 17 as if you haven’t started the race yet and you are good. Mile 16 has a mile-long 3.4% grade uphill. Oh, man, why didn’t I train hills!! Miles 20-23 in Bronx/Harlem are hilly! These are “the wall” miles and you will need to dig deep because of the hills. Mile 24…The ninja hill at 5th Ave. This is a mile-long 2.5% uphill. Mile 25-26 are all undulating hills, people. Again, why didn’t I do hill training? There is a 3.3% grade hill for a half mile up Central Park South. You will feel it. The race ends on an uphill. Yes, I’m serious. A 5.5% grade uphill. It isn’t incredibly long, but seriously, right at the end!! AFTER the finish line, you will then walk for about 30-45 minutes. I’m not kidding. (Check out the map graph above. See where it says finish line? See the teal line that merges with the green line that loops around to the red exit sign on 73rd? All of Central Park West was unaccessible until it intersected with 58th. My hotel was on 54th. I had to go all the way around.) Security is tight and they don’t let any family in, or any racers out, for blocks from the finish line. They do warn you in your race packet that it will take you approximately 30 minutes to get from the finish line to the exit. This was accurate. Herds of racers are all limping their way down Central Park West trying to exit the course. I think it was another mile (or more???) just walking to the exit from the finish line. Then when you finally do exit, you have to weave through all the family waiting for people and find out how to get where you need to go because they close so many streets! I had planned to walk straight through Columbus Circle by Trump Tower to get to my hotel, but had to walk several detour streets before I got to the hotel. Unlike some other races I have run, race etiquette is to wear your medal on Monday–on Medal Monday. I saw many racers wearing it on race day, but apparently, just Monday is the standard ritual for New York. Don’t rent bikes outside of Central Park and bike over to it. CRAZY you WILL die. It was a miracle we didn’t. Get your bikes right there in the park. And DON’T bike the park the day before the race thinking it will “keep you off your feet.” The park is super hilly. Sigh. Burned waay too much muscle glycogen the day before the race. Train hard. Check. I did this. Get good sleep the night before. Lay out all your gear. Get a race-specific pace band. I like racesmartpacebands.com. When you know it is going to be a windy race, don’t panic. It was a VERY windy race. Beautiful, sunny weather, with temps in the high 50s–perfect–but incredibly windy. Especially on the bridges. Do take an Uber to the Staten Island Ferry terminal. Do plan on leaving at 5:15 am from your hotel if you have 6:00am ferry departure. DO get on the earliest ferry you can. Don’t miss your wave trying to get on a ferry while the Staten Island Ferry terminal gets crowded. Do your waiting in the village at Ft. Wadsworth. Subways are delayed that morning and crowded. Pay the $25 and take an Uber. So worth it. Do go to the bathroom before you exit the ferry. The lines at the bus stop after the ferry are crazy long. Do bring tons of clothes. They have donation bins all the way up to race start. I had fleece pants, arm warmers, a sweatshirt, beanie, gloves and a winter coat on that I found at goodwill before I left Fort Collins. I needed them all. Before I lined up for the race, I discarded them all in the donation bin, but kept my space blanket. I only ditched my space blanket 1 minute before race start. I was glad. You warm up quick after you start running up the Verrazano Bridge. Do take the ferry–so pretty and relaxing and lots of bathrooms on board to use. Do bring a couple of space blankets for waiting for the bus after the ferry and for waiting at Fort Wadsworth. Do hit the New York City Marathon Pavillion on Monday after the race to get your NY Times edition with your name printed in it, to see the wall with your name on it and checkout the finisher gear. Be prepared that if you want to do the medal engraving, the line is gargantuan. We skipped that part. I’ll engrave it at home. Do opt for the New York City Marathon race poncho at the end vs. using the gear check. The race poncho is super nice. Flannel lined, heavyweight material, velcro enclosure. It kept me warm while I walked for 45 minutes after the race and while I walked to my hotel. Do run the Abbott Dash to the Finish Line 5k with family. This is a great shake out run and SOOO unique to run down empty New York Streets!! Plan on hours at the EXPO. Best I have ever attended. SOOO awesome and the Javits Convention Center, with all its glass roofing is spectacular. Do get a pair of the New York City Marathon Special Edition shoes. Just keep in mind that ASICS–HUGE race sponsor–is NOT the only shoe company that makes them! I bought my ASICS then saw a cooler shoe made by ALTRA for the marathon, but ASICS wouldn’t let me return the shoes–even when only 10 minutes had passed since I bought them. They won’t tell you that “all sales are final.” It prints on your receipt AFTER you make your purchase, but they won’t tell you. . . until you try and return something. Do use the Subway as much as possible. The city is so crowded that Uber takes 2-3x the amount of time to get around. (Accept at 5am on race morning. Streets were empty.) Buy an Unlimited MetroCard when you arrive in the city. 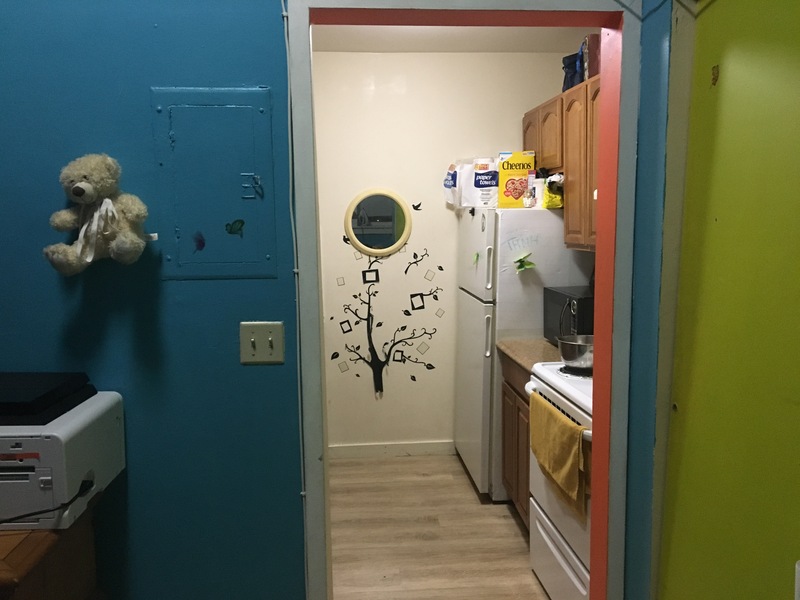 That $31.00 up front will get you far! Do get a hotel close to the finish line. It is worth the cost. You won’t be driving anywhere after the marathon – streets are all closed near the finish line. Subways are delayed and overcrowded. We loved staying at the Hilton Garden Inn Central Park. It was less than a mile from the finish line so we just walked there after the race. My son taking a very well-timed selfie with me when I went by at the 25th mile in Central Park. Start Time: 9:52 am: Green Wave, Corral 1 Wave A: –Goal: 3:07 finish; 7:10 pace. Trained for a 6:59 mile pace. . . .
26M: 9:11 (bottoms of my feet hurt. new symptom for me. rest of the body felt fine, just tight/stiff. Glycogen at zero). 3:46: 56 marathon time (8:40 min/mile avg). I may be comfortable with 7-minute miles on flat terrain, but my body is NOT comfortable with 7-minute miles on 2, 3, or 5 percent grades. Time to start training hills and if I do run on a treadmill, I will ALWAYS have it on an incline now. Let’s face it. Most courses are NOT going to be flat. Granted, they may not have as many challenging uphills as the New York City Marathon, but training on flat terrain really isn’t helping you out. Reserve your glycogen and get those carbs in. I failed to do both and I paid for it. Early. I met a really friendly woman who was waiting for an Uber at the same hotel that I was race morning. (Heather Kiersznowski from Connecticut.) She and I hung out on the ferry and bus ride and parted ways when she headed to the blue village and I to the green village. Really enjoyed getting to know her. Because of my predicted race finish time and my race qualifying time of 3:13, I was in the first wave, first corral of the green course. It felt really great going into that corral. 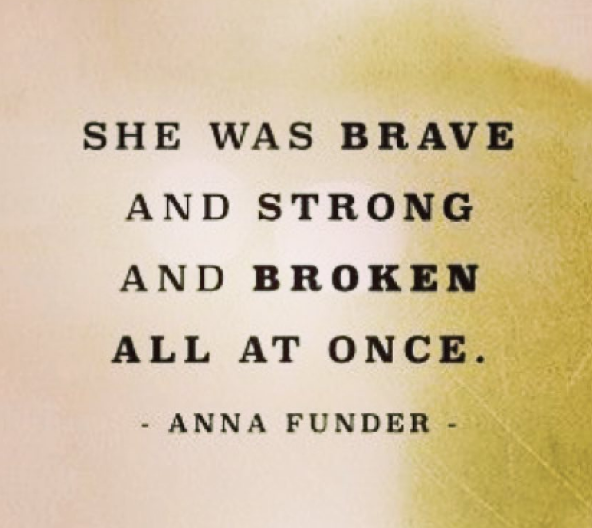 I was one among a handful of women. Felt like a rockstar. Everyone looked super fast. I really thought I was going to be able to compete with this crew. With different pre-race preparation and some hill training, I think I could have. Fun to hang out with them. So many foreigners!! So many porta-potties! So many, in fact, my longest wait in line was like three minutes–unheard of. Seriously, New York runs an amazingly organized event. I was really impressed. When we finally reached the hotel, after the race, and we went up to the room, housekeeping was cleaning it. Seriously. I had to wait in the hallway–on my feet–for another 10 minutes. It was kind of funny actually. Three cleaning women all scrambled in when they saw me and worked together to get it finished fast. My husband and son were great. They went and got me “recovery” treats and had them waiting for me in the room. Baked by Melissa cupcakes and macaroons. Yes! I showered and they patiently chilled in the hotel waiting for me and then we headed to Shake Shack so I could get my sodium fix! Delicious. I will never forget being in NYC with my boys! Priceless. Did I mention that the weather was PERFECT while we were there? 5 days of sunshine, no rain, and the only windy day was on the day of the marathon. Temps were in the mid to low 60s. Perfect. One of the most astonishing pieces of body-experiment information for me was how my body felt post-New York City Marathon vs. the other eight I have run. I had virtually no soreness. Never had to walk down stairs backwards, never had any of the usual 7-day challenges. My body was recovered and ready to run again after day 2. I can only assume this is because I ran the latter part of the marathon so slowly? Or the other theory is that this race didn’t have the aggressive downhill that so many of my other races that I have run have. But, even Boston leaves me super sore and it doesn’t have aggressive downhill so I am chalking it up to having run a slower race. . . ? Although there is a part of me that wants to return to the New York City Marathon to conquer all the areas that I failed during this race, once was enough for me. I don’t have any plans to return. It’s a stressful marathon. Lots of moving parts to get you to the starting line. Long wait for the start. A really torturous walk from the finish line to the exit and back to your hotel. Redefining the runner’s high at 1250 feet – on top of the Empire State Building after the race. And, as cool as it was to run from Staten Island to Manhattan–to see the amazing distance I traversed from the roof of the Empire State Building–I really didn’t enjoy all the hills and the 5 bridges you have to climb an descend. Was it an epic experience that I am glad I did? Yes. I will NEVER forget the feeling of walking down Central Park West and seeing my son and husband standing near Columbus Circle waiting for me. With my NYC poncho wrapped around me keeping me warm, and my medal dangling around my neck, I did feel victorious. I had to surrender to the pain each footstep issued me (new shoes..arrgh), but I felt honored to be among the other finishers as we flooded the streets; streets that had been barricaded and closed just for us. We shut down Manhattan! So many strangers congratulated me during my mile trek back to the hotel. So many smiles. So much positive energy. Even without the endorphins chemically lifting my soul, it would have been hard not to feel high and happy. Finishing a marathon–regardless of how you do it–always feels good when you are done. I went to bed that night with my Garmin Vivoactive HR telling me my feet had gone 34.9 miles. It was a VERY full day. Next up. . .Canyonlands Half Marathon in March 2017, Boston Marathon in April, Deseret News Classic Marathon in July, FORTitude 10K in September, and maaaybe the St. George Marathon in October. Pepolino (Not in Little Italy: 218 W. Broadway) Excellent homemade pasta and sauces. Get the signature ricotta cheesecake. AMAZING! Bryant Park. Play ping pong if you get the chance. Stroll through the shops, people watch, and if you brought ice skates, skip the $20 rental and hop on the ice! Hilton Garden Inn Central Park – cookies everyday, and GREAT location. Crown Tour Statue of Liberty – Awesome. Times Square Picture taking in the hallway of mirrors art installation “The Beginning of the End” by Cuban artist, Rachel Valdés Camejo. (There until Nov. 21.) The art installation was super cool. Other recommendations….Times Square is great for people watching, but always great to leave in my opinion. Carnegie Deli – Pastrami Sandwiches and Cheesecake. (HUUUGE portions). Baked by Melissa – miniature cupcakes are SOOO good. Bike Central Park – Beautiful. Bring Bike lock to stop along the way at places. Eat a crepe from a vender. Bike the Brooklyn Bridge; buy art from a bridge/street artist; eat at Grimaldi’s in Brooklyn. Get ice cream at Brooklyn Ice Cream Factory. Empire State Building – 86th floor Observatory. Lemon Scones at Irving Farm Coffee Roasters. (At the Fulton Center.) Delicious.